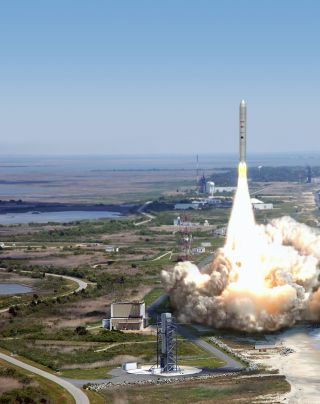 An artist's illustration of an Orbital Sciences Taurus 2 rocket launcing from Wallops Flight Facility in Wallops Island, Va.
PARIS — The inaugural flight of Orbital Sciences Corp.'s Taurus 2 rocket will be delayed by about two months, to December, to allow time for the completion and certification of rocket propellant and pressurization facilities at the vehicle's Wallops Island, Va., launch site, Orbital Chief Executive David W. Thompson said July 21. Dulles, Va.-based Orbital still intends to demonstrate its space station cargo vehicle on the second Taurus 2 flight about two months after the first successful liftoff, meaning that mission, in which the Cygnus capsule will approach the international space station, will be delayed to February, Thompson said. In a conference call with investors, Thompson said an early-June test failure of a Taurus 2 first-stage AJ26 engine is unlikely to have much impact on the rocket's overall launch schedule as an initial assessment of the other AJ26 engines in supplier Aerojet's inventory shows that two-thirds appear not to have the defect that caused the mishap. The remaining one-third will require rework or repair, he said. Orbital spokesman Barron Beneski said July 21 that the engine being tested caught fire because of a "fuel line breakage." Sacramento, Calif.-based Aerojet is overseeing adaptation of the Ukrainian-built AJ26 engine and its testing at NASA's Stennis Space Center in Mississippi. Thompson said Aerojet has already taken delivery of more than three dozen AJ26 engines. Each Taurus 2 first stage is equipped with two engines. Thompson said neither the delay in the propellant facility nor the engine failure will have a financial impact on Orbital's Taurus 2 program as both are mainly the responsibility of subcontractors. In addition, he said, Orbital had included in its early estimate of total Taurus 2 and Cygnus development costs a financial safety margin that has not been used up, allowing the company to sustain program milestone slips without exceeding its budget. Orbital will be submitting the Taurus 2 to NASA and the U.S. Air Force later this year for inclusion in the list of approved rockets used by these two agencies for missions beyond space station cargo-resupply, Thompson said. Orbital is under contract to make eight cargo delivery runs to the space station starting next year; Thompson said it is unlikely that any new orders will arrive before the vehicle's first successful flight. Thompson also said Orbital has completed a review of the March failure of its smaller Taurus XL rocket, whose fairing malfunctioned for the second consecutive time. In both cases the principal payloads were NASA science satellites whose combined cost is estimated at more than $600 million. Orbital's June 29 flight of a Minotaur rocket, a converted ICBM, used a fairing that had been redesigned to account for the two Taurus XL failures. The launch, carrying the U.S. Defense Department's Operationally Responsive Space-1 satellite into low Earth orbit, was a success. Orbital's financial results for the three months ending June 30 highlighted the company's regular business in launching classified as well as unclassified U.S. national security satellites. Thompson said Orbital's position as a relatively low-cost supplier to U.S. intelligence and defense agencies should enable it to emerge relatively unscathed from the wave of budget cuts. "Our competitive position is enhanced given our focus on affordable systems," Thompson said, adding that defense and military customers are forcing "a major shift" in focus away from large and vulnerable satellites to smaller spacecraft. Orbital has played the same smaller-and-less-expensive card in the market for commercial telecommunications satellites operating in geostationary orbit. The company has booked two commercial orders this year of the three that were awarded in Orbital's weight and power class: roughly 3,000 kilograms and 5 kilowatts or less of on-board power. Orbital expects a total of 17-20 commercial geostationary-orbiting telecommunications satellites to be ordered worldwide this year, with five or six of them in Orbital's class. The company's objective is to win three of these smaller spacecraft, and possibly a fourth, Thompson said. In its second-quarter earnings announcement, Orbital said it had "deployed the New Dawn communications spacecraft for Intelsat during the second quarter." The company did not give an update on the satellite's failure to deploy one of its two broadcast antennas since its launch in April, or the fact that the other New Dawn antenna needed more time than usual to complete its deployment. Beneski said New Dawn's C-band reflector antenna remains stuck, "although we are still grinding on the problem." He said the company's inquiry into what happened has not yet concluded its work.